Water fill center comes with both city and gravity fills and is built for convenience. No doors or locks and mounts in a low profile setting. 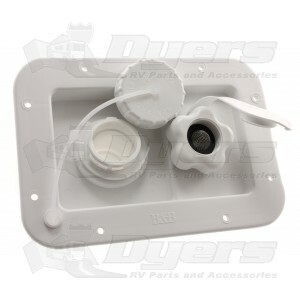 Built with a 1/2" screened air vent to make filling your fresh water easier. Replaceable plastic city water fill check valve. Cut Out Dim. 3-3/4" x 6"
Outside Dim. 5-5/16" x 7-9/16"
Replaced an old hatch perfectly.